From the Star Wars The Force Awakens collection by Hasbro. 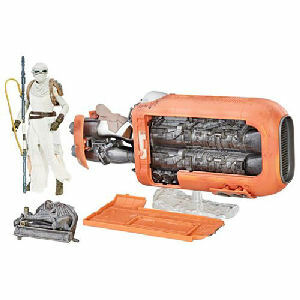 Star Wars The Black Series Reys Speeder Vehicle with Rey Action Figure. From the Star Wars The Force Awakens collection by Hasbro. Star Wars The Black Series Reys Speeder Vehicle with Rey Action Figure. Action figure measure 6 inches tall and comes with charatcter specific accessories. Ages 4 and up.